The City Hall in Old Montreal, Quebec lures in many tourists each year who love to explore this historic building and admire the amazing architecture. 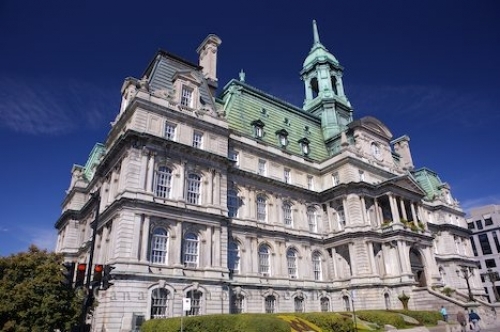 Situated in a prime location along the Rue Notre-Dame in Old Montreal, many visitors pass by the City Hall and can not help themselves but to venture inside for a tour. Montreal City Hall, Hotel de Ville, along Rue Notre-Dame, Old Montreal, Montreal city, Quebec, Canada. Picture of the historic building, home to City Hall in Montreal, Quebec, with architecture dating back to 1872.